One of the biggest mistakes I see worship leaders make is their decisions on when, and how, to incorporate new songs. So much new worship music comes out every month and it makes it very enticing for us to add new songs as often as we add videos to our Instagram story. For most congregations this is a bad idea, so here are three things to consider when adding new songs. I’m a worship music junkie and listen to it all of the time, so I want to add a new song every week. But too much music can hurt more than it helps. The average attender comes to church about 25 times a year - that’s only half of the time! So some of our people might go months before hearing a song repeated at church. That’s not good. We’ve decided to limit the amount of songs in our repertoire to 30. For six months, we will only use those 30 songs in our services. If we add a song, we take away one that has grown tired. We also try to make them all hits! If the song doesn’t hit with the congregation, we get rid of it. By doing this we will keep the best, most singable songs in our set lists and make them familiar to everyone attending. Years ago, I struggled with introducing new songs to our congregation because I didn’t have a system in place. So after trying many different options, I came up with the 1-2-4 method. Here’s how it works: introduce the song one week (1), add it again the next week (2), let it rest on the third week and bring it back on the fourth week (4). After that cycle it goes in your regular rotation. This has been a game-changer for us. Using this system helps the congregation learn the song faster and it also lets you know if the song will work for your congregation. Sometimes a song doesn’t make it to the fourth week and that’s ok. That’s why you have a system. Using this system we average a new song every month. When we add a new song I like to use a story or scripture to help people connect. When people can see how the song relates to their life, they find much more purpose as they sing. Here is an example from one of our services a few months back. Skip ahead to 9 minutes and 30 seconds where I was introducing the new Elevation song called, Here Again. It took us a while to find this system, so implement these strategies as you can. I hope you find that adding these three things to your process can help make new songs more meaningful and easier to learn than ever before. As you look through scripture you will find there are two kinds of people the Father seeks. First, He seeks those who are lost. Those who do not already have a relationship with Him. Jesus said this is why I came, to seek and to save the lost. The second kind of person the Father seeks is a true worshipper. If you notice He doesn’t say he seeks the most talented or the best looking or the most popular or the wealthiest. The Father is seeking believers who will be true worshippers. God wants worship to be not something we do, but who we are. He wants us to worship Him in spirit and in truth. I think there are three things we need to do to become true worshippers. Awe is defined as an overwhelming feeling of reverence, admiration, or fear. It’s produced by something or someone that is grand or extremely powerful. The problem is that we so often don’t see God as the Almighty God. Our minds have a hard time imagining how big God is so we make him small to help us understand. Then our worship becomes small. We have to come to the place where we can see God for who He really is. One of the ways I get a better perspective of God is by looking at creation. I love looking at all of the things that He has created. I love looking up at the stars at night and being amazed at all that is out there. Try to imagine. A light year is 5.88 trillion miles long, and the furthest thing we have measured so far is 13 billion light years away. Somewhere in the midst of all of that is a spiral galaxy called the Milky Way, which is made up of hundreds of billions of stars. One of those stars is our sun, and one of the planets circling our sun is Earth. And two of the more than six billion people on this planet are you and Me. Yet the universe that so easily blows our minds is nothing more than a speck to God. By the word of the LORD were the heavens made, their starry host by the breath of his mouth. 9 For he spoke, and it came to be; he commanded, and it stood firm. In other words God created the cosmos without lifting a finger. And when he created the heavens, He did it all without a DIY kit, an existing photo, a template, or a diagram. God was creating in the truest sense of the word, speaking the world into existence out of absolutely nothing. Worship is a verb; it’s something you do. Worship isn’t something you watch, despite what you see from many people who attend church. We see a stage with lights and chairs facing it, and receive worship guides with an outline of the “show.” So we think every part of church is put on for us. But here’s a wake up call for all believers. Worship is a participation activity not a spectator sport. Worship isn’t something we attend, like a sporting event or a concert. Worship is something we enter into with everything we’ve got. Some of you might say that’s not your personality, but believe it or not, you know how to lose yourself in worship. Just look at the way people respond at a concert or a sporting event. People go nuts when a team makes a great play or a band plays their favorite song. Those are all great acts of worship, only to a not so great god. We know how to worship with abandonment but for some reason not to the one and only true God. Shout to God! Clap your hands! Lift up your hands! Stand in awe! Bow down! Dance before Him! Make a loud noise! When you know who God is and you embrace what He’s done, your only reasonable response is to worship. Worship in awe that we even get to be in his presence. Worship with abandonment, losing ourselves in the presence of God. True worship is a whole-life response to God’s greatness and glory. The only fitting response to all He has done is to give back to Him all that we are. Worship is not determined by what we say but how we live. All of us leave a trail with our action. At the end of that trail sits a throne.You don’t get to the throne by talking about what’s there. You get to the throne when you follow the trail and find where you put your passion, energy, time, and money. And at the end of the day, you may get to the throne and find your job sitting there. Maybe it’s your brand new car. Or maybe you follow the trail of your achievements and social media and find yourself sitting on that throne. You worship what you find most valuable, and it’s usually not what you tell people you worship. Worship is not found in your words, but in your way of life. That will tell you the story of what you worship. Today we have a great opportunity to follow our treasures and evaluate the object of our worship, the god sitting on our throne. And I don’t know about you, but I want to do whatever I can to make sure that on the throne of my life is the One and only God . One day our time on earth is going to be through. And when that time comes we are going to stand face to face with a Holy God. I want to be able to say that He was on the throne of my life. Worship Singers or Worship Watchers? We have more great worship music today than in the history of the church. We have better technology in our churches than ever before. We have more apps and tools to enhance our worship experience, but less people are actually participating. How is that possible? It’s an epidemic that must change. So I wanted to share with you some steps we are taking at Stevens Creek Church to convert worship watchers to worship singers. 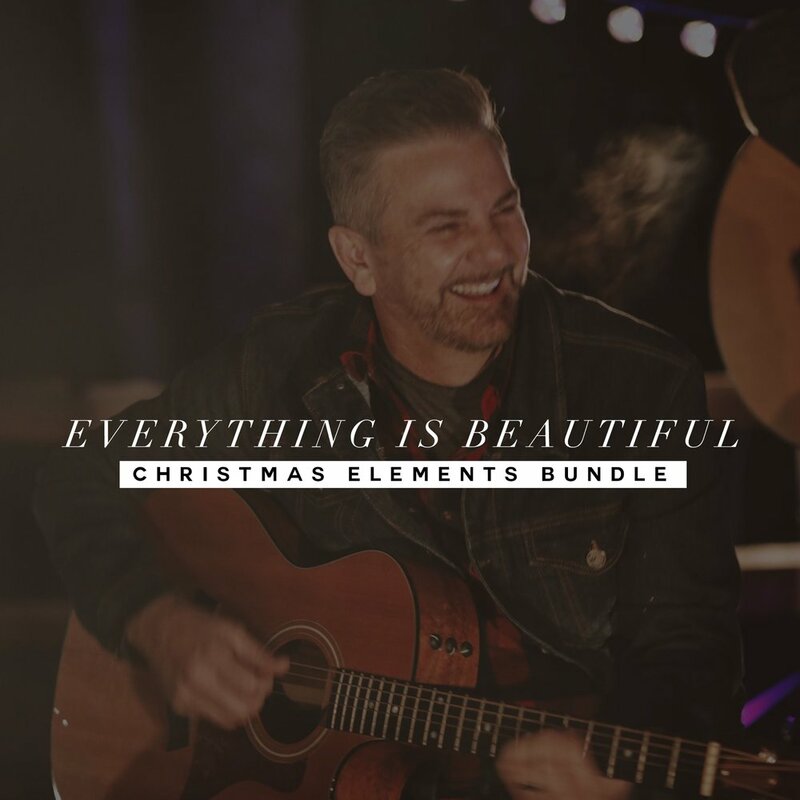 "Everything is Beautiful" Christmas Element Bundle AVAILABLE NOW! Want to implement the "Everything is Beautiful" single in your Christmas plans this year? My team has put together a bundle kit for all the elements you would need to recreate this moment in your services! Start with the MP3 of the song and we'll send you the musical accompaniment tracks or "stems", two beautifully produced narration videos in both 4x3 and triple wide format, the script to recreate those videos if you choose, and official chord charts for the music itself! This bundle is a steal of a deal. 5 Ways To Make Sunday Great! At Stevens Creek Church, I (along with my staff and many volunteers) oversee the entire “experience.” That includes everything from what you feel as you drive onto the property to the elements you see as you sit in the service. There are so many churches out there on the brink of having great experiences, but for one reason or another, they can’t seem to get over the hump. I want to share 5 things that if you can incorporate into your planning, you will see an immediate return on your efforts. At Stevens Creek we believe that creating a great experience is much more than just what happens on the stage. Of course the service is very important, but if people have a bad experience in the parking lot or checking in their kids, it makes the job of the people on stage much more difficult. Over the past 22 years, I have planned over a thousand worship services at Stevens Creek Church. That is a lot of services! When you are planning services week after week, you can very easily lose sight of what you’re trying to accomplish unless you have something to keep you on track. So I wanted to share three questions I use to stay focused on creating incredible worship experiences. Have you ever been in a worship service where the band sounds incredible, the light show is on point, and everything seems to be going right, but when you get to the end of the set and the worship leader starts to pray, the whole thing seems to lose momentum? The problem is the prayer has no focus or direction and the leader is just saying a bunch of different phrases that don't make sense. This is one of my pet peeves with worship leaders. We have to do a better job of directing our prayers at the end of our worship sets. If you lead worship often, your prayers can have the tendency to get stale and lack purpose. So I started using this three-step process in all of my prayers. 5 Ways To Make Your Easter Services Great! What do you feel when you realize that Easter is right around the corner? I get excited, but I also get a little anxious. The reason for conflicting emotions is because I realize what's at stake. More people come through our church doors that weekend than any other weekend of the year. There's no better time to have a clear presentation of the gospel than on Easter, so we better bring our A- Game. Here are 5 ways to make sure your Easter experience is awesome this year. I’ve been a worship leader for over 20 years and, until recently, if you were the worship leader of a church that meant you led all the songs, all the time, every week. Now... I know people really like me but that’s a lot of me. What I have learned over the years is the importance of having other worship leaders. Here are 3 reasons why I use more than one worship leader. Life can be so busy and demanding sometimes…..We have so many responsibilities. We have deadlines at work….we have obligations at church….we have all of the different activities with our kids and it can be so overwhelming.